The last time we checked in with Kelly Group International (KGI) team, Donovan “Van” Kelly had taken charge of an orphaned family in After the Storm. 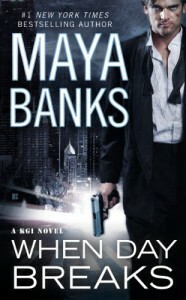 Now it’s Swanny’s turn in When Day Breaks by Maya Banks, the ninth book in her KGI series. From the first moment that I “met” Darryl “Swanny” Swanson in Whispers in the Dark, which tells of the months of captivity, abuse, and torture that both he and Nathan Kelly suffered in the mountains of Afghanistan after their mission went very wrong. With their miraculous escape and Nathan’s subsequent search to find and help his practically angelic whisperer, I also wanted to know more about Swanny - this strong, resolute, self-effacing, and quiet man. One could say he epitomizes the romantic “tortured” hero, with Banks careful and affectionate depiction of his inner and outer scars. It was definitely a celebratory red letter day for me when Swanny's story, When Day Breaks, was delivered to my Kindle.Now this solid protector would have the chance to shine. And he does. Only Banks would have the creativity and sensitivity to pair Swanny, who wears the signs of his torture both glaringly on his scarred face and body as well as within his soul, with top model and golden girl, Eden Sinclair, who at one time was named the most beautiful woman in the world. At first glance this might seem to be the most disparate “Beauty & the Beast” pairing possible. Swanny, whose self-image seems irrevocably damaged, and Eden, whose beauty has the the world at her feet. But Eden isn’t superficial or in love with her looks, instead she is refreshingly nice and down-to-earth, finding the most enjoyment during the time when she’s at home in jeans and a hoodie playing with her non-yip-yap dog, an English mastiff. Plus her entire family is made up of the same alpha warrior caste that populates KGI. Her father is a retired military special ops commander, her one brother Ryker served in Afghanistan with Swanny, Nathan, and Joe Kelly, while her other brother Raid is a cop. So Eden well knows - and can deal with - her alpha men. Swanny, since his rescue, has closed himself off from most interactions with women - aside from his KGI teammates and their families. Yes, he’s a big, strong, alpha warrior, but he prefers to reside in the background. Self-conscious about his scars, he’s afraid of having women react in horror when they see his damaged body. And frankly, he can’t imagine any woman wanting him with his scarred face. But that just proves he hasn’t met the right woman and is also blind to his own attraction, which his KGI teammate Skylar explains to Eden. Yes, he’s one of those alpha warriors who attract women like mad, but even before his captivity it’s implied that he never took advantage of that. Oh Swanny, you are a fairytale hero for sure. Even before KGI is mobilized, Banks’ makes it immediately clear that Eden holds a special place in Swanny’s heart - even though they’ve never met in person. Swanny self-reflections on the importance of the letters from Eden and news about her (including some magazine covers) that Ryker shared before the mission went south are incredibly moving. However, Swanny doesn’t think that Eden will ever notice him, but is looking forward to finally seeing this woman - this ideal - that helped him through the darkest nights of his captivity through her very existence. When Eden and Swanny meet in her Boston hotel, with all her family and his KGI teammates present, it’s quite clear that there is a strong mutual attraction between the two of them. No matter how much Swanny wants to disappear in the shadows. Eden won't let him and acknowledges to herself that she wants to know more about this man who has fascinated her for years, each time her brother discussed his teammates with her. Now, you may notice from the above description that there is far more about a romance between Swanny and Eden than there is about jam-packed, thrilling action. That’s because although Eden does have a stalker/assassin after her, that really isn’t the focus of When Day Breaks. Instead, action takes a backseat to one of the most beautiful, compelling, and inspiring love stories that I’ve ever read. Now, some of you may stop right now and say to yourself, that’s not the KGI I want to read. If you do that, I think that you’re doing a disservice both to yourself, Maya Banks, and a series and characters that, in my view, continually breaks and remakes the mold of a romantic suspense series. Maya Banks is one of the most talented writers around and is able to create characters that set up home in our reader hearts. The KGI family - the Kellys and their teammates - have become, book by book, people to care about. 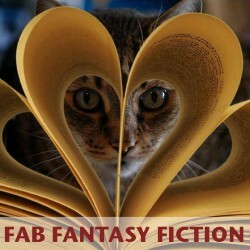 Because of this, I realize that passions run high with this series and expectations about what the books should be like. All I can say is that the way Banks is envisioning and presenting KGI, her books will continue to be preordered and remain on my must-read shelf. So please add When Day Breaks to your bookshelf if you’re looking for a title that is inspiring, passionate, populated by characters that one can truly admire. It is a story that I am proud to share with a younger relative for them to use as a sort of updated fairytale, with a hero and heroine to admire and fall a bit of reader in love with. True beauty is drawn from the spirit within, and both the writer behind When Day Breaks and the story itself epitomize this.